Obviously a false positive. You can always "build" it yourself if you don't trust it. I've made some visual changes at MCE, mainly to appear better at UBU. I'd like your opinion on whether horizontal lines are useful. Which one do you prefer (a or b)? First one it is easy to read - follow. The reason for the ASRock error is simple, folder Files > ASRockA5 is missing. Yes, that was the reason for the error messages I got. EDIT: I just have uploaded the fixed UBU package "UBU_v1.70-a10_DEV-fixed_without-MMTool" to my MEGA account. @plutomaniac B is the best, we read left to right, not up to down loll and cleaner coding too. I like B, to me it is more concise. So I have to say that it seems still not possible to update specific modules on this board unless it's being updated by any bios update, but I have my doubts on that. Your problem is caused by the mainboard manufacturer, who has put too many modules into the the DXE Driver Volume, and has nothing to do with the UBU tool. Why don't you solve the problem yourself by removing unneeded DXE Driver modules? After having done that, you can update the modules, which are important for you, by using the UBU tool. Important! We did not check how correctly patched MMTool works with Aptio 4 BIOSes. That is, while there is still no opportunity to flash Aptio 4 BIOS, which was processed with the help of the patented MMTool. If anyone decides to make a mistake, please report the result. I can test it with my Z68 chipset system and will let you know the result. On ubu 1.69 11 fix it says it need mmtool v5 ? surely a version detection issue ? echo ! Requires MMTool version 5 ! Add 'rem' or delete all lisnes. The patched MMTool v5.2 worked perfectly with my ASUS P8Z68-V system. 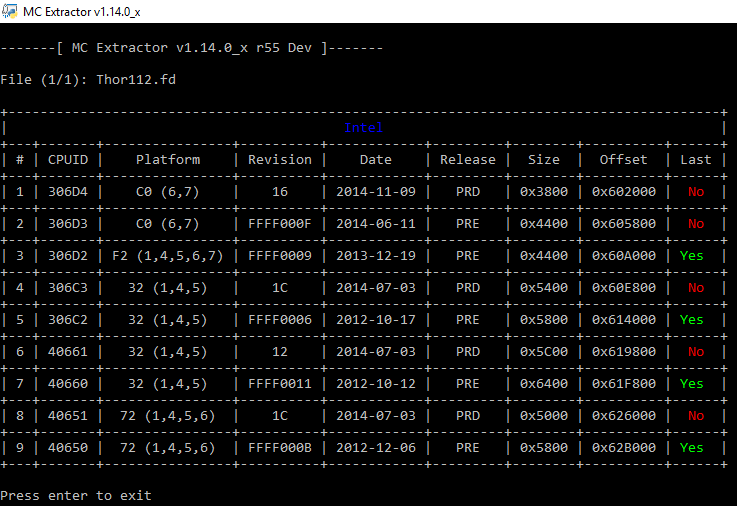 As first step I ran the UBU tool v1.69.11-fixed using the patched MMTool and loaded the latest original BIOS v3603. Then I updated everything, what the UBU tool was offering. As you can see, everything went fine. Nevertheless I ran into a problem while trying to update the Intel LAN Option ROM: It didn't work at first try. The SetDevID tool gave me the message, that the DLL file named msvcr.dll is missing. This issue may have been caused by the fact, that I am currently running the Windows 10 Insider Preview Build 17083, which doesn't have such file within the Windows folder. After having downloaded and inserted the missing DLL file into the UBU folder, even this task has been completed successfully. Before flashing the finally modded BIOS, I opened it by using the the patched MMTool and the UBU tool (still using the patched MMTool). Note: Obviously due to its strange structure the inserted NvmExpressDxe_3 module cannot be detected by the UBU tool. I already knew that from other UBU users. As final step I flashed the previously modded BIOS into the BIOS chip of my ASUS P8Z68-V mainboard. 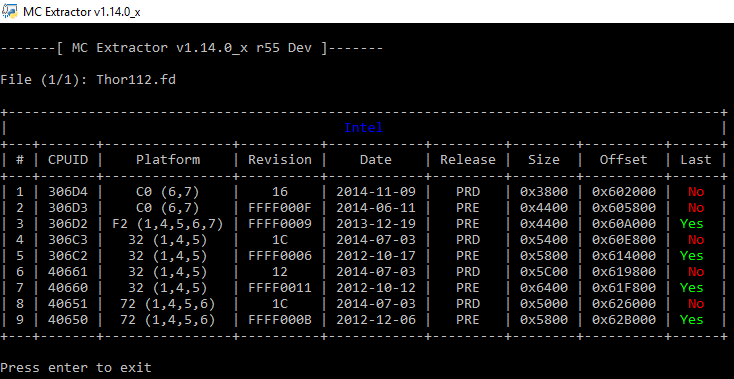 To make sure, that the modded BIOS really had been successfully flashed, I checked the Intel RAID Utility version and it really was the v12.9.0.1006 (original version: v11.2.0.1527).